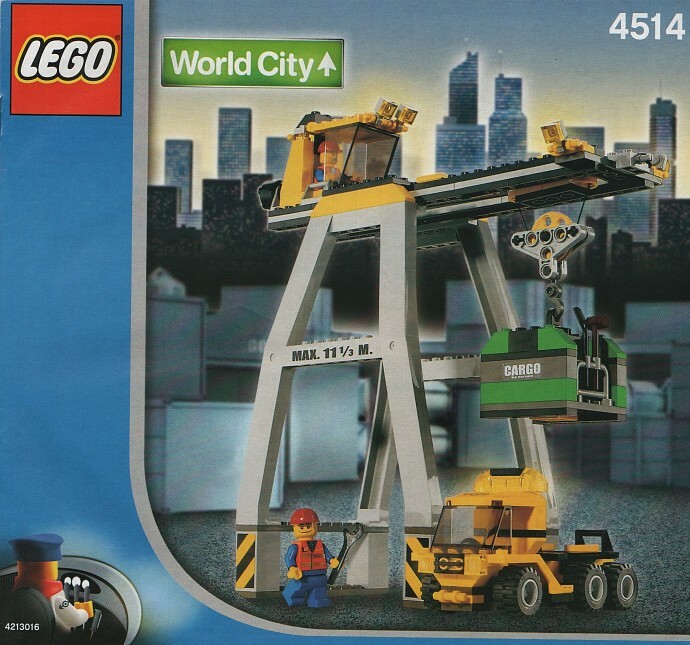 Today's random set is 4514 Cargo Crane, released in 2003. It's one of 28 World City sets produced that year. It contains 177 pieces and 2 minifigs, and its retail price was US$20/£14.99. It's owned by 1252 Brickset members. If you want to add it to your collection you might find it for sale at BrickLink or eBay. I've always loved these random World City/City sets. It's so refreshing to get something beyond Police and Fire subthemes. Especially when it's a useful design. Definitely one of those sets I wish I had picked up when they sold them! Now which country is that in? I like this set. That grey piece seems big, but it helps the intended design quite well. And those guys' faces... I haven't seen them before. Close, but not quite "there"... Prototypes of the City aesthetic, no doubt. ^Well straight ahead from where I am is Antartica. Now, I don’t want to offend any Antartican Bricksetters, but last time I checked there weren’t any affluent cities there. Definitely not this “World city.” Perhaps the sign is pointing in the wrong direction. ^Turn around then, you'll find an entire world at your feet. Another one of those train sets that I wished I'd bought at the time, but never quite got around to. Not if you read the instructions upside-down. I have a few of these. The crane is rather skeletal, but functional. The main thing is the modular cargo worked with the freight AND passenger trains of the time, which was really cool. Wish I’d figured out ways to make it more robust. It’s too fiddly for my kids. Yet another set that needs to be remade, I hope LEGO makes a ladder for these figures to get there. Funny how many people were drooling over the crane in the app revealed a few days ago 'cause they had it and it was a great set and then this pops up.